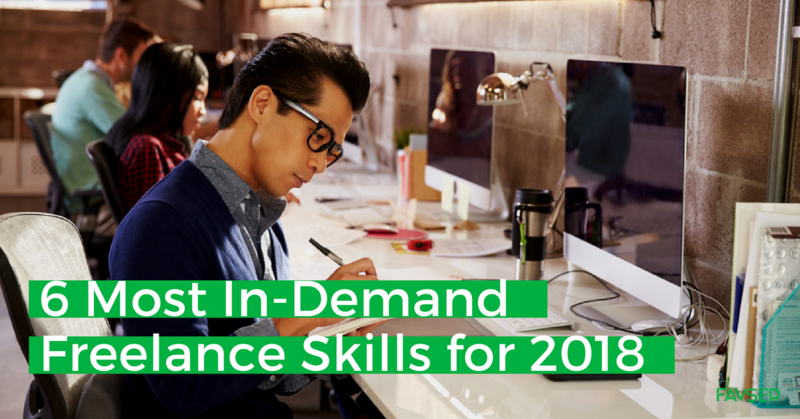 6 Most In Demand Freelance Skills For 2018 - As times shift, industries’ needs have evolved accordingly. Demand for digital skills that will contribute to business growth is at an all-time high. To attain success as a freelancer, freelancers need to meet current demands as successfully as their full-time counterparts. The number of websites on the Internet is increasing steadily. In 2017, there is a whopping 69% increase of number of websites from the previous year. As competition increases, website optimisation is crucial to gain an edge over competitors. Search engine optimisation (SEO) is the skill to boost a website’s ranking on the list of a search engine’s result page. Why is this important? On average, 91.5% of clicks go to the first page and 32.5% of traffic goes to the first result of search engines. Proper SEO techniques will result in increased exposure and subsequently ensure audience reach. It is also important to not use unethical or outdated techniques as the search engine algorithm changes frequently. User experience (UX) is an equally important component of website optimisation. It is considered to be a boost to SEO if done correctly. Simply put, UX focuses on how users experience the website. Many factors can influence UX, including aesthetics, usability and mobile friendliness. If you visit a business website, chances are you will stumble upon their blog where they share helpful information. Or it may happen the other way round, with the article introducing you to the solution that the business provides. Either way, content creators are the wizards behind creating content optimised for the web. Content creation involves writing relevant and consistent content in line with the brand’s content marketing strategy. Another popular form of writing on the web is copywriting. The difference between the two lies in the intent-copywriters write to capture attention and create a lasting first impression, while content creators aim to write cohesive, insightful articles to build meaningful connections with the audience. Proofread and edit is also an in-demand skill, as perfect grammar is crucial to deliver the right message. After all, no business wants to be misunderstood or get reprimanded by grammar Nazis! Graphic design is the art of putting images, text and other media together to create an impactful visual impression. It is important to build a lasting first impression, especially online where first impressions are formed rapidly. In fact, a study found that website visitors take less than two-tenths of a second to form a first impression. Graphic design is important for both online and offline branding. Impressive graphic design can do wonders to improve user experience. Solid graphic design is key to ensure the brand gets noticed and remembered beyond the first interaction. Photographers are in-demand to shoot moments of special occasions, from small-scale personal photo shoots to weddings and large corporate events. Besides capturing important moments, photographers can also take pictures that are relevant to a business’s marketing campaign. With the advent of social media, pictures capture attention quicker than written posts. Consistent posts of quality pictures on social media can go a long way to establish a brand’s identity. Digital marketing encompasses a large range of online marketing efforts. Love to use social media? Help businesses to optimise engagement and use appropriate hashtags on these platforms with social media marketing. Other digital marketing efforts include email marketing, pay-per-click campaigns and online PR. Up the game by applying data science to digital marketing! Interested to freelance with these skills but are not sure if you have what it takes? Contrary to the traditional employment route whereby it is a requirement to possess a relevant degree for employment, it is not necessary to own a degree to be a freelancer. However, an appetite for growth is important to continue learning relevant skills and be aware of changes in the industry. Due to the high demand for these skills, there are many online learning platforms featuring lessons by experts in their respective fields. Popular online learning platforms include Udemy, Coursera and Lynda.com. As Martin Luther King Jr. puts it, “Faith is taking the first step, even when you do not see the whole staircase”. Put in the required effort to learn and practice and in no time, you will be a respected freelancer in your chosen field! Ready to take the leap? Freelance with Favser - it only takes a few minutes to sign up!